Paula Radcliffe failed to realise her dream of adding Olympic gold to a glorious marathon career as Romania's Constantina Tomescu won gold. The 34-year-old started well but faded and briefly stopped two miles from home appearing to suffer from cramp. 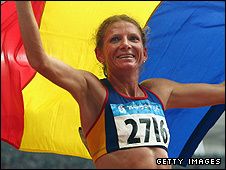 Tomescu, 38, led from the halfway stage to claim glory while Britain's Mara Yamauchi finished in sixth place. "I pushed hard and wanted my gold medal," said Tomescu. "I was looking back the whole time." But despite constant nervous checks over her shoulder, the Romanian was never caught and won the gold. It was less straightforward for Radcliffe, who only confirmed her participation in the marathon a few days before the event. Radcliffe was determined to make amends for her performance four years ago in Athens, where she dropped out after suffering from dehydration. But despite a valiant effort she failed to keep pace with the leaders, finishing in a time of two hours 32 minutes and 38 seconds. "I was trying to achieve the impossible because the amount of running I had done wasn't enough," an emotional Radcliffe told BBC Sport. "Cardiovascularly I felt comfortable but my legs had gone. My calf went first then it went up the entire leg and it felt like I was running on one leg. "I was going to get to the finish line no matter what, because that was my race." Kenya's Catherine Ndereba edged China's Zhou Chunxiu to silver after a battle down the home straight, while Britain's Liz Yelling finished 26th despite falling heavily 10 miles into the race and was taken to hospital for a check-up. Yamauchi, 35, looked comfortable throughout the race and her sixth place finish equals the best performance by a British woman in the marathon at an Olympic Games. "I really wanted to get a medal but it was a really good field so I am pretty happy with sixth," she said. 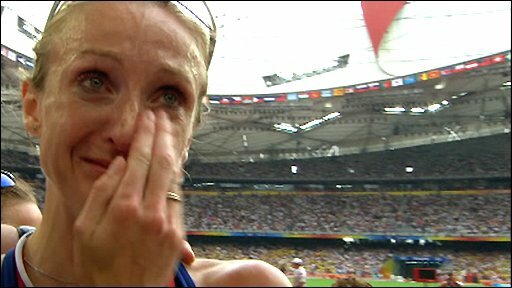 Radcliffe, in tears at the finish line, said she would run at the London Games in four years' time to try to finally win an elusive Olympic gold. "We'll still keep our fingers crossed for 2012," she said. "Maybe the Olympics won't happen for me, but I can do it in 2012 if my body holds together." The runners set out at a steady pace from the historic Tiananmen Square with the early morning start - 0730 local time - favouring the athletes as the temperature and humidity stayed relatively low, while the lack of strong sunshine stopped pollution becoming a major issue. Britain's trio stuck with the pace setters in the early stages, with Yelling deciding to take up the lead early on. Deena Kastor, the 2004 bronze medallist, dropped out of the race after three miles and looked clearly distressed as she pulled up clutching her foot. Tomescu was the first athlete to really make a move at the halfway mark as she opened up a lead between herself and the rest of the field, which was led by Radcliffe. With more than seven miles to go, Radcliffe and Yamauchi were both still in touch, as was pre-race favourite and 2004 silver medallist Ndereba. However, Radcliffe faded as the pace continued to increase and Yamauchi was left to fly the British flag. Tomescu was greeted by a huge roar as she entered the Bird's Nest Stadium almost one minute ahead of Ndereba and Zhou, storming to victory in a time of 2:26.44.